I am in Korea now! at the internet cafe! i didnt keep my promise to blog abt beijing. erm ok i promise when i go back and when i am super free, i'll blog. cos im damn sian lah. oh and im having a lot of fun! got nth much to say. when i go back then i blog more abt this yea? then saturday i went to help for CEDAR OPEN HOUSE. so fun lah. but very tiring! i had duty dat day. got to noe quite a lot of people lah. i was in charge of one of the games booth Colourful Chaos. then got a lot of people come and play. haha. but mostly Cedarians lor. that day, i realised that it isnt easy to plan and organise this kind of events. you need to have enough manpower and stuff. i saw the effort the PCs and PSLs put in. haha they were really great! this is probably the last event held at this Cedar Campus. nxt yr we are moving to the old VS.
so i took some photos. i shall upload it some other time. oh and nxt time i must compare them wif the new campus! havent blogged for soooo many days. i so lazy and not in the mood also. i got back my results on erm 26 oct.
i rather not talk abt it anymore. everyone did their best and well, the results cant be changed alr lah. oh and i am very sorry 1A. i made a lot of ppl so sad. and thanks to all those who have shown concern towards me. thanks a bunch! natalie, i promise not to slack! i will do my best! you must do your best too! JIAYOU people! 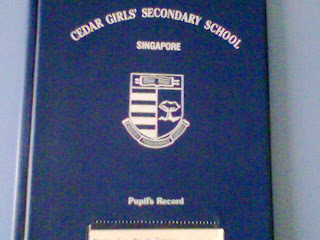 I am sure 1A will do very well nxt year! oh and 1A won the best class award! Woohoo! 1A is the best class on earth!